A Martin Luther King Jr. video airs. 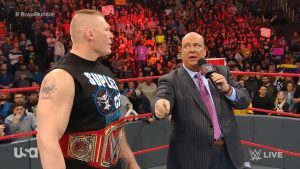 Heyman and Brock come down and Paul cuts a promo on how Balor pinned Cena. He commends Balor for stepping up and taking advantage of the opportunity given to him. On Sunday, he will attempt to defeat not just any man – but Brock Lesnar, and he will turn Balor into a martyr. Vince comes out and says that any fan in the world can tell that Balor has no real chance against Brock Lesnar. Braun comes down to big before Balor comes down and says he beat the Greatest of All Time last week before Paul corrects him and says he’s the second-greatest behind Brock Lesnar, but he may continue. Finn says he believes and the Balor Club believes he can do it. Vince makes Brock and Heyman sit at ringside while Braun faces Balor. Braun lands a big corner charge for 2. Braun goes for the charge, but eats a slingblade. Braun tosses Balor into Brock, who hits a belly to belly overhead suplex on the floor. This isn’t a DQ for some reason. Slingblade hits Braun and Brock eats a shotgun dropkick on the floor. 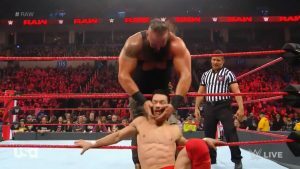 Finn eats a Biel into the ring, but Braun eats the post! Brock comes in and hits an F5 to force a DQ. There was a ton of moving parts here, but the goal was to put Balor back into the main event mix firmly and it did just that. Lashley comes out and we get a recap of his win complete with Cole saying “curb stomp”. 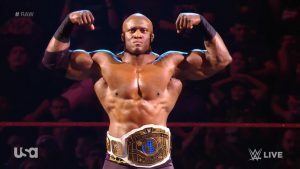 Lashley gets up on a podium to pose, but Lio puts the belt on him off-center so it all looks odd. Apollo comes down and wants a posedown – but Lashley beats him up mid-pose. Crews beats up Rush with a press slam, leading to a Lashley match and Lashley beats him with a spear when Apllo goes for a press slam again and gets speared. Seth comes down and says that as long as he’s got a fire in his eyes, he’ll go to Phoenix and win the Rumble! He cuts an outstanding promo about being a longshot to win, but his whole life has been one. He grew up in a small midwest town and could’ve just been on a farm – but thanks to his dream, he’s in WWE. Drew cuts him down on the mic before saying he has a zero percent chance to win. Seth vs. Drew is every match they’ve ever had, but with a bit more of a David vs. Goliath story, as Seth is able to outsmart the brawn of Drew. He avoids a claymore with a superkick and gets a schoolboy for the win. 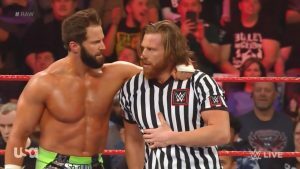 The Revival talks to Vince about wanting a fair guest referee. Curt wants one more shot and Vince makes Hawkins the ref for their match. Dean cuts a promo from a caged area backstage saying that on Sunday, justice will be served. Jinder and the Singhs get a jobber entrance against the Lucha House Party, who gets a bigger intro than the former WWE Champion. Metalik beats a Singh with a tilt a whirl backbreaker. Elias sings for a bit before being interrupted by Corbin. They have a nothing match and Corbin wins with the End of Days. Alexa brings out a bunch of women for the Rumble match before Nia causes a brawl to break out. Alexa says they’re all very passionate, but she will also be in the Rumble this year. Lacey Evans comes out looking like Lois Lane from a Fliescher cartoon and mocks Alexa for being a sawed-off runt. The winner of the Rumble will be a classy, sophisticated lady in Lacey Evans. Heavy Machinery destroys the Ascension and wins with the compactor. Gable and Roode face the Revival, with Gable getting thrown off the top into a dive. The heels use the Heenan/Warrior finish, but Hawkins spots the cheating. He catches Wilder with his feet on the rope. Dawson reverses a bodypress for 2.9 – but Hawkins spots that he has the tights. Dawson shoves him and Gable stacks up Dawson and wins. The Revival goes to beat up Hawkins until Zack Ryder returns to save his fellow Edgehead! Ryder got a nice pop and despite not being on TV in a year, he’s still shockingly over. Cole mentions them being former tag champs and them being former tag champs in that role is a perfect example of getting a lot of mileage out of a nothing reign. Renee talks about how new Network subscribers getting the Rumble and the Chamber PPV. Ronda cuts a weird promo about Sasha seemingly wanting her to cut her hair off and wash Sasha’s feet with it. Everyone comes out mid-ring and Sasha says that Ronda got everything handed to her after she was the iron woman in last year’s Rumble. Nattie works as a face in peril for a while until tagging Ronda in. She goes for a flying something on Bayley, who just catches her and moves her over to her corner to tag Sasha in. Sasha hits a double sledge and it hits, but Ronda gets the armbar, but Sasha gets the ropes. Nattie tags in and suplexes Sasha, but the back stabber and Bank statement win it.